Hi there, my darlings! While scheduling this post, I just realized how long it has been since I've posted a review of Above The Curve and their pretties! Now, most of you know how much I adore Shawn and Angel of ATC so this was a totally unacceptable situation in my eyes! Thankfully, the gorgeous Valentine's Day collection showed up just in time to remedy that! Let's jump right into swatches, shall we? First up, I have for you You Java Me Crazy--a warm reddish-brown polish with scattered holographic sparkle and added shimmer . Both the formula and application on this polish was great and the swatches below show 2 generous coats with 1 thin coat of G&G's HK Girl to finish the look. Such a rich, cozy shade! 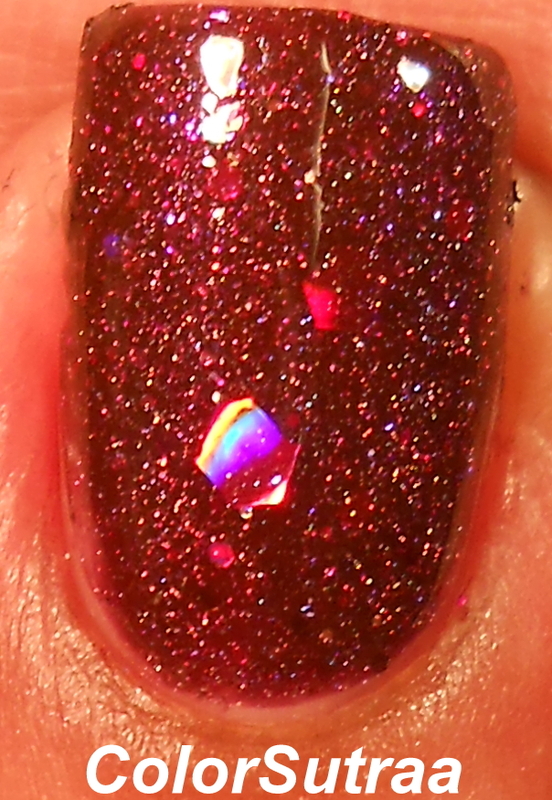 Next, I have for All You Need Is Wine--a reddened plum jelly polish accented with "red, bright pink, lavender, purple, fuchsia, garnet, bronze, gold, cinnamon and rose" glitters in various shapes and sizes (the description in quotes is from Above The Curve's store). Again, no issues to report with the formula or application and the swatches below show 3 coats with 1 thin coat of G&G's HK Girl to bring it all together. I absolutely love this polish--so gorgeous! The third polish in this collection is Truly Madly Deeply--a gorgeous dark orchid purple with a linear holographic finish and added shimmer . Both the formula and application on this polish was lovely but I couldn't really pick up the shimmer on camera or in the pics while I was editing them. The swatches below show 2 generous coats by itself. LOVE this! The pictures with flash show the purple tones MUCH better! 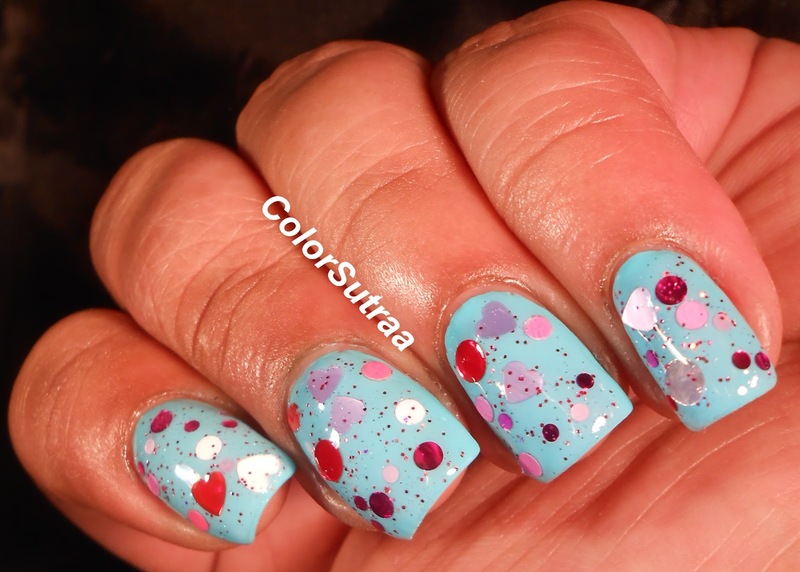 Last but definitely not the least, I have for you Circle of Love--a clear glitter topcoat packed full of various shades pink, red, and white circle and hearts with added red holograpgic microglitter . Great formula and application--I didn't have to fish for anything at all, even from the mini bottle. The swatches below show 2 thin coats dabbed over 3 coats of Milani Aqua Brisk. I wanted to go a little bit brighter with this swatch and I absolutely adore how this look turned out--so gorgeous!! So there you have it, my darlings!! If you need to add any of these beauties from the Valentine's Day collection to your stash, you can find them HERE for the price of $8.50 for a full-size, 15 mL (0.5 oz) bottle. Be sure to follow Above The Curve's FACEBOOK PAGE and INSTAGRAM for all the latest news and updates! Which one is YOUR favorite? As always, I'd love to hear from you in the comments section below!